A prison officer had his finger cut off when an inmate kicked shut a cell door, it has emerged. The officer, one of the younger members of staff at HMP Leeds, also had to have surgery to reattach the tip of a second finger. An inmate, who had kicked the cell door in frustration, did not know the officer was holding the other side. The inmate has since been transferred to another jail and West Yorkshire Police have begun an investigation. The accident happened on Thursday after the prisoner was told to return to his cell. The BBC understands he was reluctant to go back and kicked out at the door in frustration. The prisoner was "distraught" after the officer was injured, saying he did not know the officer was holding the door. The officer's little finger was completely severed when the door closed. The tip of his other finger was reattached during an operation. A Prison Service spokesperson said: "An incident took place at HMP Leeds on 21 March resulting in an officer receiving hospital treatment. "We are unable to comment further while a police investigation is ongoing." 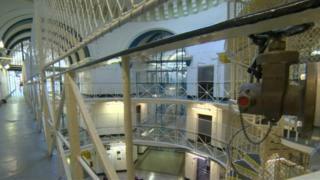 HMP Leeds is one of 10 prisons that are part of a government programme designed to reduce violence and drug-taking. Prisons Minister Rory Stewart, has pledged to resign if the number of recorded assaults has not fallen by the summer.